Find your lowcountry vacation paradise within the friendly confines of True Blue Resort, offering modern two or three bedroom Pawleys Island condos just inland from pristine beaches! Situated among centuries-old live oaks and along one of the Grand Strand's premier golf courses, the vacation condos of True Blue Resort will exceed your expectations and ensure a first-class Pawleys Island vacation experience! The contemporary Pawleys Island condos of True Blue Resort will wrap you and your guests in comfort and convenience. All the features of home will be provided, including fully-equipped kitchens, multiple TVs with cable and washers and dryers. The majority of our vacation condos also provide complimentary WiFi access, and all units offer spectacular area and golf course views off of private patio and balcony areas. 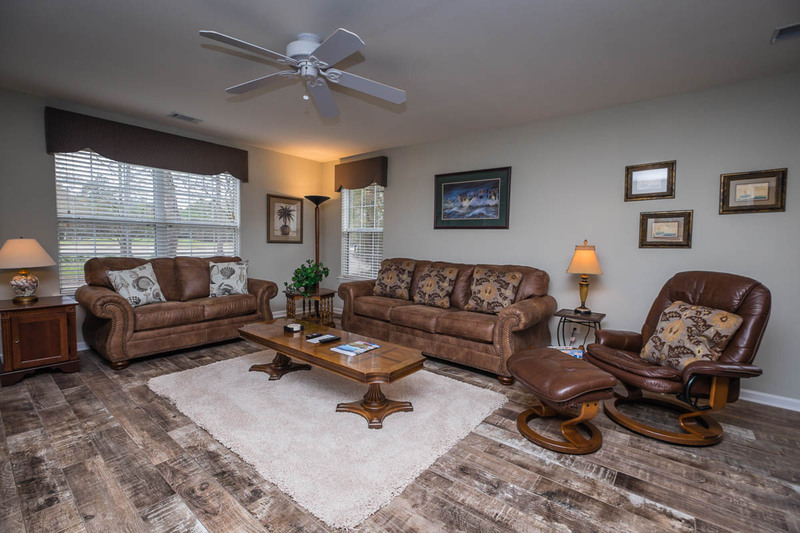 Roomy floor plans ensure lots of space to stretch out and relax, and the condos of True Blue Resort offer flexible bedding arrangements that are ideal for families and golf groups. The properties of True Blue Resort are truly some of the finest condos in Pawleys Island and are sure to be the perfect accommodations for your upcoming Pawleys Island vacation! Your leisure is guaranteed outside your condo with great resort amenities that you can enjoy on your getaway. Multiple outdoor pools are located throughout True Blue Resort, offering a fantastic place to splash and cool off on a sunny Pawleys Island afternoon. Jacuzzis are also available throughout the resort for relaxing in after a long day on the beach or golf course. And speaking of golf, you owe it to yourself to test your game on the prestigious True Blue course. This Mike Strantz-designed masterpiece will dazzle golfers of all skill levels, showcasing a one-of-a-kind layout that incorporates the unique lowcountry landscape into 18 holes that are equal parts rewarding and challenging. Outside of True Blue Resort, all the great shopping and dining options of Pawleys Island are mere minutes away! Fresh local seafood, steaks and more are just some of the mouth-watering options on the menu at nearby restaurants like Bistro 217, Chive Blossom or Perrone's. Handmade local crafts and unique coastal souvenirs are available at local shopping venues like the Hammock Shops Village. Pawleys Island is also home to popular destinations including Brookgreen Gardens, Huntington Beach State Park and Atalaya Castle. The southern Grand Strand location of Pawleys Island offers access to the heart of Myrtle Beach with a half-hour drive north, and guests can also visit southern destinations like Georgetown and Charleston in just over an hour. True Blue Resort is also less than two miles from the pristine shores of Pawleys Island, so beach trips are a breeze! With first-class Pawleys Island condos nestled in a lowcountry oasis, True Blue Resort is sure to provide amazing accommodations on your next Pawleys Island vacation! Come see why coastal Carolina travelers have returned to this special area for over a century and book a getaway with True Blue Resort today!